The mace, known as Jian, is one of the short weapons and originated in the Jin and Tang dynasties. In the Ming and Qing dynasties, many people used to carry the mace. Made of iron, it looks like the hard whip, but with no joints and no tip at the head. 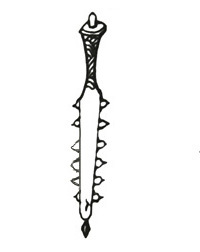 The cross section of the mace is a diamond formation with a grove on it so it was also called the concave mace. The size and length of maces differ in accordance with the height of the users, usually between 65 to 80 cm in length. There are single and twin maces; the latter were more used. The playing methods include grinding in the air, sweeping below, cutting in the middle, chopping, lifting on the two sides, and pressing. The movements include three in horizontal and four in vertical directions, jumping and leaping, pounding, rolling, poking, cutting, fending and hanging. Mace play requires fierce and quick actions. In paired practice twin maces are used against the spear.